The St. Denis Chapter of the LSDAR met Saturday, Oct. 21 to discuss plans for their Patriotic Tree. The tree is featured in the City Bank downtown branch. The tree honors veterans with red, white and blue stars. Red stars represent active duty personnel, white stars represent deceased veterans and blue stars represent living veterans. The tree went up Nov. 21 at 9 a.m. and will be there until Nov. 21. 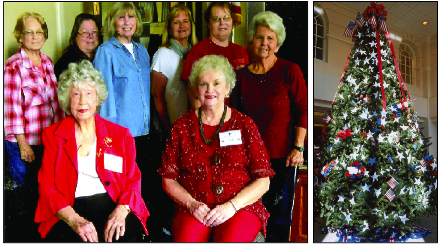 The public may see the tree during bank hours, Monday-Friday from 9 a.m. – 5 p.m. On front row from left are Dr. Colleen Lancaster and Rosie Finical. On back row are Nelda Liles, Peggy Bamberg, Julie Callihan, Shauna Withers, Judy Kavanagh and Diane Gunter.